Samsung Electronics held a meeting on the 23rd and emphasized again about safety and excellence of iris authentication technology that is applied to Galaxy Note 7. Although DNA, which has genetic information, is the safest and ultimate biometrics information, Samsung Electronics explained that realistically it is impossible to use DNA information on portable devices such as Smartphones. According to Samsung Electronics, it is practically impossible to use someone else’s iris information since it disappears in just 4 seconds after one dies excluding any extreme situations such as kidnapping. Percentage of having identical iris information is only one out of one billion and iris information has qualities like uniqueness, inalterability, and undamagebility. Not only is iris information different between twins but it is also different between one’s left eye and one’s right eye. Information about iris is stored in a trust zone (independent hardware storing space that was developed by ARM) and is not sent to any servers. When one creates an account, iris authentication technology checks whether iris information that is saved and a user’s iris are same or not and sends only this information to outside servers. Because this technology does not actually send iris information, it does not matter when information is stolen during a process of transmitting information. Samsung Electronics is planning to focus on expanding an ecosystem that is based on biometrics such as iris authentication and fingerprint authentication in the future. It is also planning to expand its partnerships with South Korean and foreign financial institutions as KB Bank is planning to introduce iris authentication service shortly. 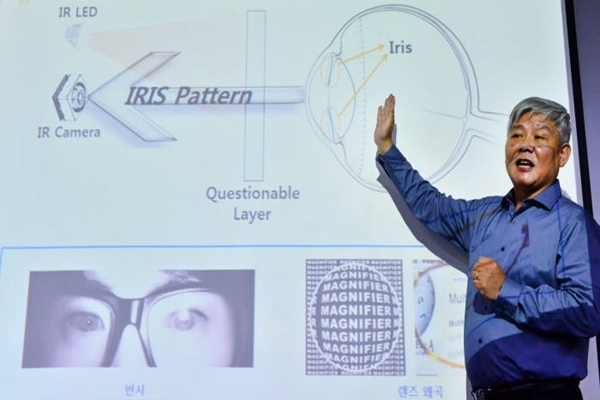 It has also decided to focus on improving iris authentication technology by expanding angle of view and allowing this technology to easily recognize iris even when one is wearing glasses or contact lenses.